There were certain indelible images we had of The Monkees, and that was Mike's cap, Mickey's goofy looks and Davy's cuteness. Of all of them, Davy's character was the softest. He was the nice guy, the crowd pleaser. - Phil Gallo, senior correspondent of Billboard magazine. 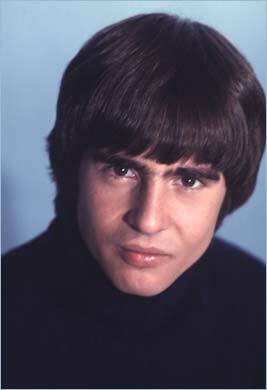 Well, I've just learned that Davy Jones of The Monkees died in Indiantown, Florida at the age of 66. The former teen idol apparently suffered a massive heart attack and passed away unexpectedly at his Florida ranch. I feel a great sense of sadness and nostalgia. It's as if a part of my childhood has vanished. The truth is that I had a big crush on Davy when I was a 10-year-old in Grade 5. I would listen dreamily as he sang "I Wanna Be Free." I hung up magazine posters of Davy and the other Monkees all over the walls of our playroom and I never missed an episode of their television series. My brother was not impressed with my fondness for The Monkees and he chided me for it. He insisted that The Beatles were far more talented and that I was wasting my time. Of course my brother was right about the superiority of Beatles' music. Of course there is no comparison between the two groups. It's just that he had absolutely no understanding of how cute I thought Davy was and how captivated I was by his English charm. A native of Manchester, England, David Thomas Jones was born on December 30, 1945. Young Davy appeared in the popular British soap opera Coronation Street in 1961. At the age of 15, he portrayed Colin Lomax, the grandson of Ena Sharples, on the soap. The diminutive Jones later became an apprentice jockey in Newcastle, but abandoned his plans to be a rider in order to perform in the theatre. He eventually made a name for himself by portraying The Artful Dodger in the London production of Oliver!. Davy Jones achieved stardom when The Monkees debuted on NBC on September 12, 1966 Inspired by The Beatles film A Hard Day's Night, it was a fast-paced, youth-oriented progam. Jones, along with his co-stars Mickey Dolenz, Mike Nesmith and Peter Tork, portrayed a rock quartet who became involved in all kinds of madcap adventures and pranks. The show's original popularity did not last long and the series left the air in 1968 after two seasons. Davy Jones was married three times and divorced twice. He is survived by his third wife, Jessica Pacheco, a presenter on the American Spanish-language network Telemundo, and his four daughters. He leaves two daughters from his first marriage to Linda Haines: Talia Elizabeth (born October 2, 1968) and Sarah Lee (born July 3, 1971) and two daughters from his second marriage to Anita Pollinger: Jessica Lillian (born September 4, 1981) and Annabel Charlotte (born June 26, 1988).